For me, the experience of sitting was completely different than I thought it would be. That is, I thought the 'being looked at' part would be more prominent. I became deeply absorbed, just hearing the sounds of the city--cars passing, high heels clicking, dogs barking, conversations... and noticing the response in my body. There was incredible peace sitting in that window, somehow interspersed with moments of fear and wonder. Another surprising thing was how many people walking by seemed to think we were statues or some kind of realistic art! True, as far as I know there has never been living beings in this window before. (It is the art display window at Artists Television Access or ATA.) There was a huge range of reactions, from awe, respect or curiosity, to disbelief, to suspicion or scorn. A lot of misunderstandings about meditation were expressed, too...and some seemed not to realize that we can hear, even if our eyes are closed! 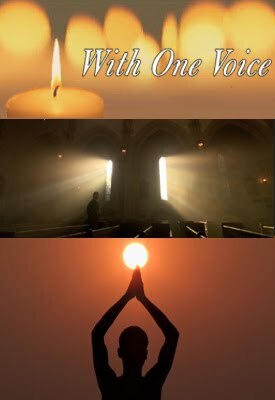 The event included a screening of Matthew Flickstein's ecumenical documentary about mysticism called "With One Voice". Even though some sector of our culture seems to be rather attached to the idea that 'all religions are the same'...the approach of this film isn't like that. It simply documents the intersections of human spiritual experience through the voices of the people who are devoted to it in apparently very different ways--sufis, Buddhists, Hindus, Quakers, lay people, monastics... The screening was well attended and well enjoyed. By the way at the moment this excellent film is not available from Netflix or video stores. You can buy it at withonevoicedocumentary.org. How Was It--Sitting in the Window? "I had the experience of noticing my thoughts arise, then they would dissolve, even if I wanted to hold onto them! Usually there is the constant struggle to stay in the present but yesterday I was anchored to a larger, more still space. It was amazing. I was in a blissful state for the rest of the day." "A couple of dudes passed by and I heard one tell the other, 'Hey, bang on the window!' I prepared myself for the thud, but I didn't hear anything. I wondered if they were cute." "Many people wondered if we were real. In the second sit I sent loving-kindness to the people walking by on Valencia Street. At the end of the two sits I felt really energized and excited. 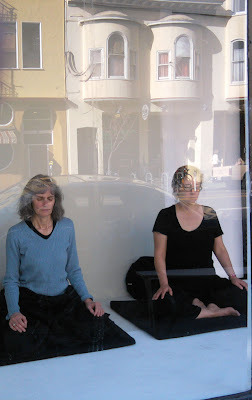 I think the energy of Valencia Street affected my meditation a lot. I was glad to be part of it." "I'm so glad we did this event!...It was impossible for me to feel anything but kindness and solidarity--different than what I thought it would be--this was a strong practice situation! Being visible while practicing is a wonderful thing to do for oneself and everyone who comes by, strangely intimate." "It was pretty amazing. Where I thought I'd be all fidgety, worrying about losing my concentration I was actually quite still. Even when someone banged on the window I barely moved." "Holey f---, that's my cousin!" "How long have they been there?" "I don't see anyone sitting in lotus position!" "They're not sleeping, they're concentrating." "I wish I could do that." 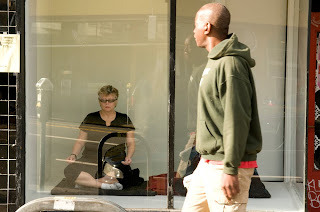 "Passive aggressive, sitting in the window meditating." "That's not a real person, is it?" "Yeah, I'm pretty sure it is." "Wow, that freaks me out." "See look, there they are." "No, people don't breathe when they meditate." "Really? Are you sure she's not breathing?...See, that's why I can't meditate." "Oh my god. Are those real people?" 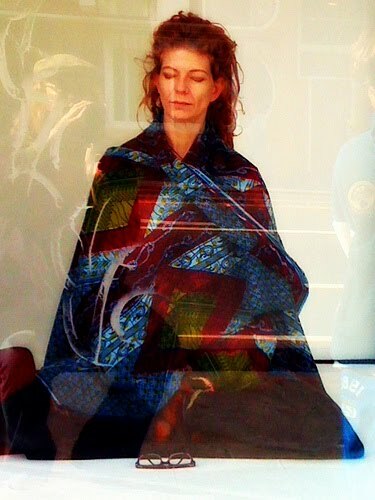 "Is it art or is it meditation?" Article about this project -and Obama's State of the Union Speech - from Citisven on the Daily Kos. Window photos by Suvarnaprabha, IdentityTBD (Flickr), Acarasiddhi, and Ethan's cousin. Marina Abramović at NY MOMA: "The artist is present." oh wow, Suvarnaprabha, so great to read it from your perspective. Thank you all for doing this, it was really meaningful for me in so many ways. Thanks for posting this, it's great. I loved the experience and don't want to wait a whole year to do it again! Where else can we meditate in public? Let's do it!